Dr. Weber is actively involved in minimally invasive approaches to cancer treatment, including both laparoscopic pancreas and liver surgery. 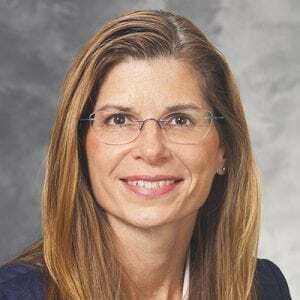 She has been invited as a speaker/moderator at many national meetings, including the American College of Surgeons, the American Hepatopancreaticobiliary Association, Society of Surgical Oncology, and Society of University Surgeons. Dr. Weber provides a wide range of services including Bile Duct Resection, Caudate Resection, Cryoablation, Cyst Fenestration (Unroof Liver Cyst), Cytoreductive Surgery with HIPEC, Frey Procedure, Gastrectomy – Partial or Total, Hemihepatectomy (Hepatectomy), Laparoscopic Liver Resection, Liver Resection, Liver Tumor Ablations, Melanoma Completion Lymph Node Dissection (Axillary and Groin), Melanoma Sentinel Lymph Node Biopsy, Melanoma Wide Local Excision and Skin Closure, Obstructed Pancreatic Duct Drainage (Peustow Procedure), Pancreatic Head Resection, Pancreaticoduodenectomy, Pancreatic Pseudocysts Drainage, Pancreatic Resections, Radical Cholecystectomy, Radiofrequency Ablation, Right Hemihepatectomy, Right / Left Extended Hemihepatectomy (Hepatectomy), Wedge Resection of the Liver, Whipple Procedure. Dr. Weber conducts translational research at the UW Carbone Cancer Center evaluating novel tumor selective agents which may be promising for imaging and/or treating tumors. She also conducts clinical research evaluating prognosticators of outcome in patients with liver, bile duct, and liver tumors. Defining the Role of Lymphadenectomy for Pancreatic Neuroendocrine Tumors: An Eight-Institution Study of 695 Patients from the US Neuroendocrine Tumor Study Group. Minimally invasive versus open distal pancreatectomy for pancreatic neuroendocrine tumors: An analysis from the U.S. neuroendocrine tumor study group. Association of Perioperative Transfusion with Recurrence and Survival After Resection of Distal Cholangiocarcinoma: A 10-Institution Study from the US Extrahepatic Biliary Malignancy Consortium.